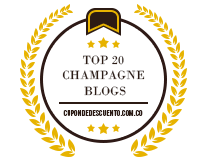 for people who love champagne and all things sparkling! I love a chance to visit Tasmania. I have trekked through some of its great natural landscapes, the Overland Track from Cradle Mountain to Lake St Clair, Bay of Fires lodge walk, and Freycinet looking over the beautiful Wineglass Bay. But it is not just the scenery that I love; they also do food and wine exceptionally well! In particular, they make great bubbly! Tasmania’s reputation for producing some of Australia’s best sparkling wines is increasing each year, thanks to the pristine cool climate, which is very similar to the Champagne region of France and perfect for growing grapes for sparkling. Such is the reputation of sparkling wines from Tasmania, according to Tyson Stelzer, award- winning wine writer and reviewer “No region anywhere on the planet outside of Champagne itself makes sparkling as exceptionally as Tasmania”. High praise indeed! My research for this blog was made up of a series of trips in 2018 and 2019 (as well as attending Effervescence a festival of Tasmanian Sparkling wine). In contrast to mainland Australia, Tasmania as an island state is compact, but it is bigger than you think, it is not possible to cover everything in a few days. For the purposes of this blog I have broken it down into a few regions: the Tamar Valley (north near Launceston), East Coast (Freycinet), and Hobart and surrounds. 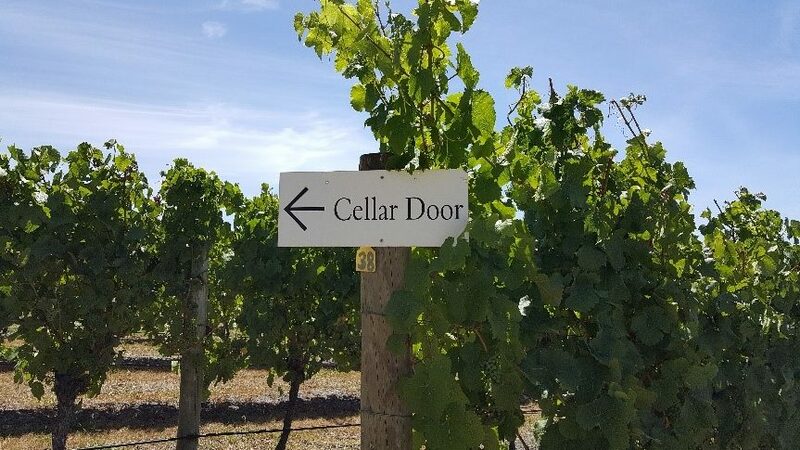 As always, I suggest that you check the winery website to confirm opening times, tasting fees, and to make bookings for tours or meals, which I suggest that you do for most of the Cellar Doors with a restaurant. There are so many sparklings on tasting here, a visit to the Cellar Doors really is a bubbly paradise! I suggest that you will need a designated driver, and there are a few local tour operators that offer wine tours, which is always a good way to find your way around, Uber is available in Hobart and has now arrived in Launceston, and local taxis could also get you to the Cellar Doors that are located near to one of these cities. 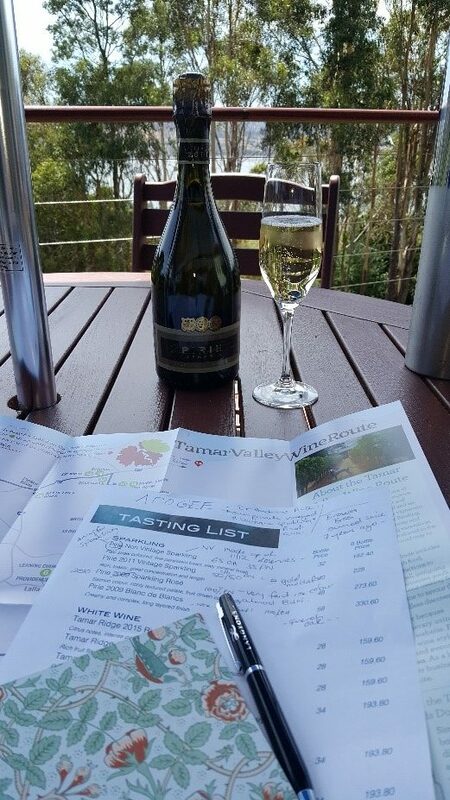 The Tamar Valley Wine Route covers the wineries in this region, I realised this can even be broken into a few smaller regions: Relbia just south of Launceston, West Tamar, East Tamar and Pipers River in the North East of the Tamar. The area enjoys a significant climatic advantage that is unique to the rest of Australia; that of very low day time temperatures caused from the local geographical features. The waters of Bass Strait cool the hot northerly winds, while the cool southerlies gain heat as they cross the island. Cool temperatures and significant sunshine hours make for ideal conditions to retain delicate aromas in the fruit. The frosty and sometimes wild conditions of winter give way to clear, crisp, blue-sky days through the growing season, allowing the fruit to ripen slowly and evenly, assuring the lingering acidity essential to producing premium cool climate wines. This Cellar Door is around a 15 minute drive from Launceston. Josef Chromy OAM has been instrumental to the Tasmanian food and wine industry, having owned and developed some of Tasmania’s leading wineries including Rochecombe (now Bay of Fires), Jansz, Heemskerk and Tamar Ridge. In December 2007, at 76, when most people would be thinking about easing up, Joe launched Josef Chromy Wines. Joe fled his war-torn Czech village in 1950 as a penniless 19-year-old. “I came here with nothing but hope and ambition over 50 years ago. Tasmanians welcomed me and, with their help, I have been rewarded for the challenges and risks I have taken in both the meat and wine industries”. Arrival at the Cellar Door rewards you with a venue that includes a stunning restaurant, overlooking a picturesque lake and vineyard. It is listed as one of the Top 10 Cellar Doors of Australia and the restaurant has been awarded a Chefs Hat in the Good Food Guide. The menu features locally sourced produce, and you can enjoy dining in the restaurant or purchase a Cheese or Meat/Cheese Platters to enjoy in the grounds. I visited during Effervescence Tasmania. The vineyard catered for this event very well, and a few of the smaller Tassie sparkling producers told me that they use the facilities at Josef Chromy and the expertise of chief winemaker Jeremy Dineen to make their sparklings. I visited the Cellar Door again in early 2019 and enjoyed a delightful meal in the restaurant. There are a few sparklings available for tasting from the Josef Chromy and Pepik ranges, or available by the glass in the restaurant. Bookings are required for tasting groups of 6 or more. Behind the scenes wine tours are also available to be booked on the website. Tamar Ridge Cellar Door is high in the hills overlooking the beautiful Tamar River. I was very happy to find lots of sparkling on tasting and to learn the story of the Pirie range. Pirie is named after Dr Andrew Pirie who has been a very influential figure in the Tasmanian wine industry, initiating and building some of Tasmania’s largest and most important vineyards and wineries including Pipers Brook Vineyard, and Ninth Island which he co-founded with his brother David in 1974 and Pirie sparkling in 1999. Andrew Pirie no longer owns the Pirie label as it was sold to Brown Brothers around eight years ago, but he continues to be involved as a consultant and ambassador for the brand. He now has a new vineyard Apogee (more about that later), consults on wine industry development, conducts climate research and is writing a book on wine terroir. Pirie NV Sparkling, made up of around 12 different reserve wines, 65/35 Chardonnay/Pinot Noir. Fine persistent bead and minerality. Pirie 2011 Vintage Sparkling, 50/50 Chardonnay/Pinot Noir, rich and toasty with great length. Pirie 2010 Sparkling Rose, 100% Pinot Noir, very faint salmon colour, almost a Blanc de Noirs, rich palate and complex fruit. Pirie 2009 Blanc de Blancs, 100% Chardonnay, lovely honey toast nose, creamy, complex with a long layered finish. Resident chefs Hubert & Dan, provide fresh, seasonal platters with local and house made cheeses, salmon and charcuterie to complement the tasting experience. I made this my lunch spot and sat out on the deck with a view of the river through the trees, a platter and a glass of the 2011 Vintage whilst I made my notes. The perfect office! A small producer embracing innovation “We make wine powered by the sun” in 2017 they built Tasmania’s first 100% off grid winery and follow traditional small batch wine making philosophies with modern winemaking techniques. The small Cellar Door, is a cottage with a great verandah with views out over the vineyards. Tasting plates featuring specially selected, local produce are available to complement the wines. I met Fiona who manages the Cellar Door, and sales and marketing and her husband Julian, who is the winemaker. I tasted the NV Sparkling Blanc de Blancs. Single vineyard, hand vinified, hand bottled and hand disgorged. It is fine, crisp, and creamy cuvee and has been aged on yeast lees for 12 months. They recommend “Enjoy with oysters and good friends” which sounds like a good idea to me! Since my visit I notice that this wine won a Silver Medal at the 2018 Tasmanian Wine Show. I also tasted a Blanc de Noirs from their sister vineyard Native Point which is on the other side of the Tamar and notice that they now have their own Moores Hill Blanc de Noirs available for purchase. This small rustic Cellar Door, is located a bit off the beaten track. The staff here were very friendly and shared a bit about the story of this family owned winery. They also shared some great tips on other sparkling Cellar Doors in the area. I tasted the NV Sparkling which is a 60/40 Pinot Noir/Chardonnay. Lovely crisp citrus and green able with spicy berry notes from the Pinot Noir. Local cheeses, terrines and salmon products are available to purchase, to create your own platter with some lovely spots for a picnic with vineyard and rural views. Some weekends the Bird n’ Herd BBQ food truck is also on site. This wasn’t on my list but I dropped in here on the off chance that they might have a bubbles, and I was rewarded with one. It is a small Cellar Door. The partners are close friends from two families who chose the Tamar Valley as the place to start their winemaking. I met Tony one of the owners who was very friendly and introduced me to the Goaty Hill Sparkling, which is described as Vintage, Baked Apple, Moreish. They also serve Gourmet Platters and Cheese Plates, available daily from 11.30 – 3.00 and can be designed for 2 people or more. A small family friendly Cellar Door. This family business owned by Fran Austin and Shane Holloway, who are partners in wine and in life and they are producing a great range of quality sparklings. Predominantly focused on Traditional Method sparkling wines, that are 100% estate grown and produced — a Grower/Producer in the true sense of the term, they describe that they are on a journey to create a unique range of handcrafted single site sparkling wines. I met Alice the Cellar Door manager, and when I told her about The Bubbles Review, she found both Fran and Shane who generously spent time with me to share more about the story of the vineyard. Fran at the time, was juggling maternity leave with winemaking duties. I could clearly see the passion and dedication of this hardworking team for achieving their goals of making sparkling wines of exceptional quality, and unique in character. Non Vintage Cuvée – a blend of vintages with the majority coming from 2014 vintage, with 30% of reserve wine adding complexity and depth. 2014 yields were particularly small, giving wonderful concentration of flavour. Around two years aging on lees. Non Vintage Sparkling Rosé – pale salmon colour and an aroma of fresh strawberry and musk, 100% hand harvested Pinot Noir with reserve wine from 2016 adding complexity and around two years aging on lees. 2014 Sparkling Cuvée – the 2014 vintage delivered very small crops of exceptional quality and will be highly sought after. Rich and complex, opens with honey and develops through the palate, with stone fruits and fine line of minerality, a lingering and complex finish. Around three years aging on less. 2012 Vintage Sparkling Rosé – 100% Pinot Noir. Five years aging on lees and a low dosage of less than 2 grams allows the voluptuous flavours of the fruit to shine through. 2013 Blanc de Blancs – 2013 was something of a rollercoaster with some very warm, dry days and rain before vintage but this all lead to some intense flavours in the fruit and high levels of complexity. 5 years aging on lees and a low dosage of less than 2 grams. 2008 Late Disgorged Blanc de Blancs – 100% Chardonnay. 10 years aging on lees and a low dosage of less than 2 grams allows the voluptuous flavours of the fruit to shine through and the clear acid backbone to be a focal point of this wine. Local produce is available to purchase to ‘pick your own picnic’ emphasis is on seasonal produce that suits a picnicker’s palate. You can enjoy under the pergola, with the different tasting options. The Jansz Tasmania vineyard sits to the northeast of the island state within the Pipers River region of the Tamar Valley. This cool little corner is known colloquially as ‘Sparkling Tasmania’. I learnt a few things about this area on my visit. Temperatures here are moderated by close proximity to Bass Strait. The ocean breezes keep the temperature up during winter – minimising risk of frost, and down in summer – allowing the grapes to ripen slowly and develop intense, delicate and refined flavours. The soils are also an advantage, resting on a bed of pure, red, free-draining basalt soils, the Jansz vineyard is the perfect site to grow grapes for world-class sparkling wines. Jansz has evolved as one of Australia’s most respected premium sparkling wines and has trademarked the term Méthode Tasmanoise. “It could be argued we’re completely mad growing grapes in the wild and unforgivingly cold Tasmanian environment. But there’s méthode to our madness. The climatic conditions of the Jansz vineyard rival the famed French wine region of Champagne. In fact, it was originally with French contribution that Jansz became Tasmania’s first sparkling made using the traditional Méthode. 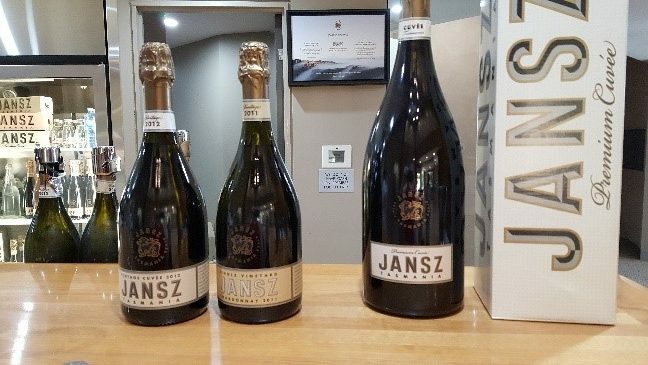 In a previous blog on Favourite Aussie Sparklings I included Jansz as one of my ‘go to’ labels. 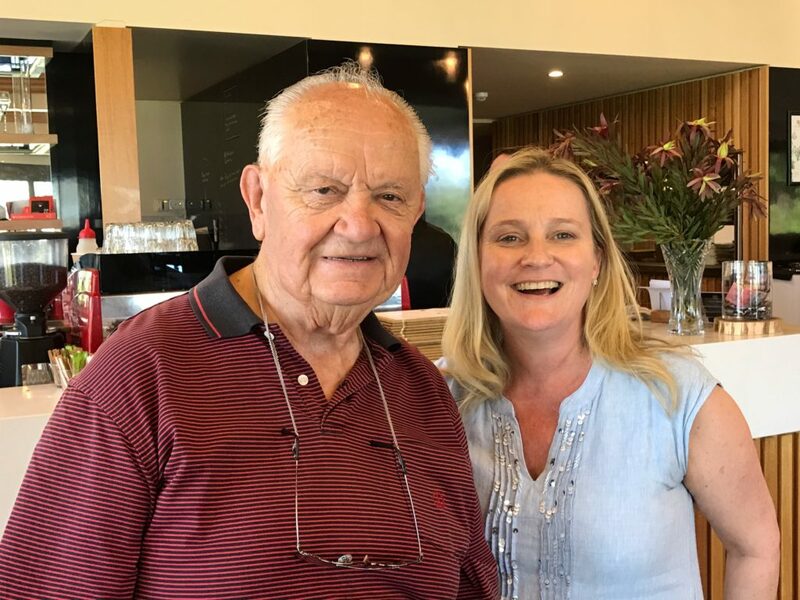 I was so happy to be here at the vineyard and was pleased to meet the Cellar Door manager Maxine, already a subscriber to The Bubbles Review who was excited to see me and provided some great information to add to my notes. Maxine told me that it is still a family owned operation, a handcrafted and passionate brand who along with some of the other founders in this region (and supported by the study by Dr Andrew Pirie), recognised the similarity of this area with the Champagne region and the opportunity to create quality sparkling wines. With added input from Jean Baptiste from the Louis Roederer Champagne House it is easy to see why Jansz has evolved as one of Australia’s premium sparkling wines. The Cellar Door is the Jansz Tasmania Wine Room and includes an Interpretive Centre. It is adjacent to the vineyard, overlooking a picturesque lake, cheese boards are available to purchase to enjoy with tastings. Jansz Tasmania Cuvee 2012 – 50/50 Chardonnay/Pinot Noir, spend 6 months in oak before aged for 5 years on lees. Complex aromas, lemon peach and hazelnuts. Layered and elegant. Jansz Tasmania Single Vineyard Chardonnay 2011 this Blanc de Blancs is not something that is made every year. It is limited release with each bottle numbered, as the name suggests it is from a single block of Chardonnay at the Jansz vineyard. The wine is 100% aged in French Oak and then spent 6 years in second fermentation in the bottle (aged on lees). Very pale gold colour, layers of citrus, almond nougat, with creamy texture and chalky long palate. The Jansz and Pipers Brook vineyards share a driveway, and you will see a sign pointing to Pipers Brook just after the entrance. An unmade driveway over the hill through the vineyard, reveals ocean views as you drive through the vines to arrive at the architecturally designed winery building. At Pipers Brook you can taste Pipers Brook, Ninth Island and Kreglinger wines. The café was closed for refurbishment when I was there, but has since re-opened featuring fresh, local Tasmanian produce. There are already some great results. In his 2018 Sparkling Report, Tyson Stelzer listed the Ninth Island NV Rosé as the Sparkling Wine of The Year Under $25 (a great achievement for a Rosé) with Ninth Island Non Vintage Cuvee listed as a runner up for the title. The acclaim follows the Gold Medal win for the NV Rosé at the 2018 Tasmanian Wine Show. Ninth Island Non-Vintage Sparkling, blend of Pinot Noir, Chardonnay, Pinot Meunier, this is another good quality sparkling at a great price. Ninth Island Non-vintage Sparkling Rosé, rose petals, fresh strawberry, spice and pouring cream. The blend showcases the Pinot Noir, supported by fresh zesty structure of Chardonnay. Rich layered palate. Pipers Brook 2015 Vintage Cuvee, lemon, rich brioche, oyster shells. Kreglinger 2004 Brut de Blancs, 100% Chardonnay, a lovely Blanc de Blancs, full palate, depth of flavours. Kreglinger 2006 Brut Rosé, 100% Pinot Noir, rose petals, ripe strawberries, cream with a great dry finish. Bay of Fires’ cellar door is the Tasmanian home of Bay of Fires, House of Arras sparkling wines. Bay of Fires Wines was founded in the 1990s by a team of dedicated winemaking and viticultural professionals, who believed Tasmania would one day become the pre-eminent Australian region to produce cool-climate Tasmanian wines. The philosophy for Arras sparkling wines is to create world class sparkling wines. Created by Australia’s most awarded sparkling winemaker, Ed Carr, outstanding fruit is sourced across Tasmania’s premium cold climate regions. The art of blending sparkling wine is one that can only be mastered by perfecting the craft, patience to allow the wine to mature at its own pace and the experience to know when it is at its best. The entire portfolio of Arras sparkling wines are held back between 3-10 yrs to give these wines the distinction, quality and maturity they require to be world class, unique sparkling wines. Over the past 20 years Ed Carr has amassed more than 100 trophies in Australian wine shows including 21 consecutive “Best Sparkling White Wine of Show” trophies at capital city wine shows. In 2018 he became the only non-champenois to receive a Lifetime Achievement Award at the Champagne & Sparkling Wine World Championships in London, alongside the legendary chef de caves of Charles Heidsieck, Dom Pérignon, Billecart-Salmon, Taittinger, Perrier-Jouët, Lanson and Pommery. To see Tasmanian sparkling acknowledged in such company on the global stage is an amazing achievement! At the ‘Tasmanian Sparkling Takes on the World’ Masterclass that I attended at Effervescence Tasmania, in a blind tasting of eight sparklings including a few big name champagnes, the Arras EJ Carr Late Disgorged 2003 was overwhelming voted the favourite. It was Ed’s foresight and firm belief in the potential of Tasmania as Australia’s best sparkling fruit resource that was the driving force behind the company’s 1995 decision to produce Tasmanian prestige cuvée, evolving into the House of Arras range. December 2002 marked the release of the 1998 Arras – the first vintage made from 100% Tasmanian fruit. The Cellar Door experience offers gardens with sweeping views over the vines, the winery and Pipers River. 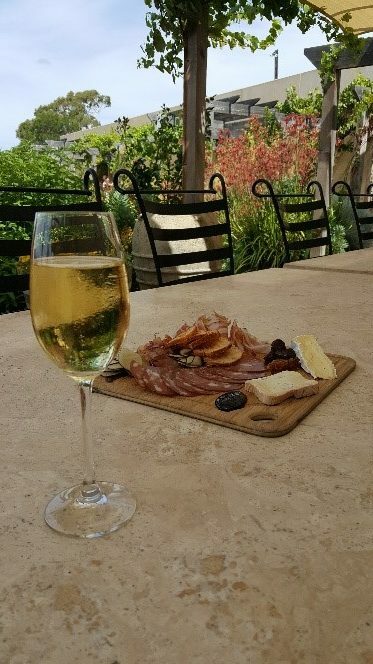 With local cheese and artisan pizzas to enjoy with the wines, this is one of the few sparkling wineries that served food in this area, so you could plan for a lunch stop here. There is also a seated Premium Arras Tasting Experience. The staff here were great, I met Alicia and she generously shared her knowledge of the wines, the vineyards and the local region. Arras Grand Vintage 2008 (just changed over from 2007). 65% Chardonnay, 35% Pinot Noir, aged for 7 years, complex full palate wine, lingering finish, aromas of toast, honeycomb, sourdough and nougat. Arras Rose 2006 65% Pinot Noir, 35% Chardonnay (with a dash of Pinot Meunier), a light salmon colour, it is barely pink, lovely savoury flavours balanced with ripe strawberries. Clover Hill is one of Australia’s very few premium sparkling houses solely producing sparkling wines in the traditional method. With the intention to produce a refined sparkling wine to rival that of great Champagne houses, Clover Hill was established in 1986 on the site of an old dairy farm in north eastern Tasmania. These first plantings produced Clover Hill’s debut vintage in 1991. Since this time, Clover Hill has become synonymous with elegance and refinement, gaining a reputation of uncompromising quality. A new Cellar Door opened in late 2017. A long-time favourite of mine, I am in good company as it was chosen by royalty when ‘our own’ Princess Mary chose Clover Hill Vintage Brut to be served to celebrate her wedding to Prince Frederick. It was also selected as one of the four iconic Australian wines served to Queen Elizabeth II and The Duke of Edinburgh during their Australian visit in 2011. Clover Hill is acknowledged as one of Australia’s finest sparkling producers. With the cool climate and growing conditions of Tasmania being remarkably similar to that of the Champagne region of France, Clover Hill has been able to produce sparkling wines of quality, elegance and finesse. Ian, the Cellar Door Manager discussed some of the background of the new building, the owners of Clover Hill (the Goelet family from France, who also own Taltarni in Victoria) wanted a Cellar Door to reflect the quality of the brand. The new Cellar Door stays true to the 3 pillars of Clover Hill: terroir, method and blend. This beautiful architect designed building with rammed earth walls made from the local terroir, features a tasting room that has doors opening up onto the deck with panoramic views of the vineyard, natural forests and Bass Strait. Inside is a relaxing lounge area with plush ottomans, a tasting bar and a VIP room for Club Prestige members wanting a peaceful moment. A perfect place to sit and taste your way through the Clover Hill range! Clover Hill’s commitment to excellence has been recognised with numerous awards including being inducted into the Australian Sparkling Hall of Honour in 2017, twice awarded Tasmanian Vineyard of the Year, and the Gourmet Traveller 2018 Cellar Door Awards – Best Tasting Experience. 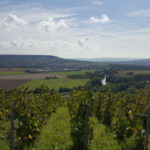 Clover Hill is planted solely to the traditional sparkling wine varieties of Chardonnay, Pinot Noir and Pinot Meunier. These varieties are all trellised in traditional close proximity plantings. A strong focus on Chardonnay is acknowledged and rewarded with Tyson Stelzer naming the Clover Hill 2005 Cuvée Prestige Late Disgorged his Blanc de Blancs of 2018. Some of the wines featured are available for regular tastings, some with the VIP Experience and some you won’t find in stores as they are only for purchase at Cellar Door. 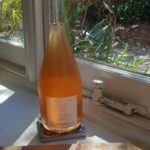 Clover Hill Tasmanian Cuvée Rosé, NON-VINTAGE – 54% Chardonnay, 43% Pinot Noir, 3% Pinot Meunier – delicate salmon pink colour, with a soft and creamy mousse. Strawberry and dark cherry notes marry perfectly with the wine’s fresh brioche characters. The wine is well structured, with sweet red berries and cream enveloping the palate. Clover Hill Tasmanian Cuvée, NON-VINTAGE – 53% Chardonnay, 42% Pinot Noir, 5% Pinot Meunier- Delicate and soft mousse, on the nose, notes of bright citrus, fresh apples, brioche and cream. On the palate, crisp apple pie and lime characters. Great drive and length. 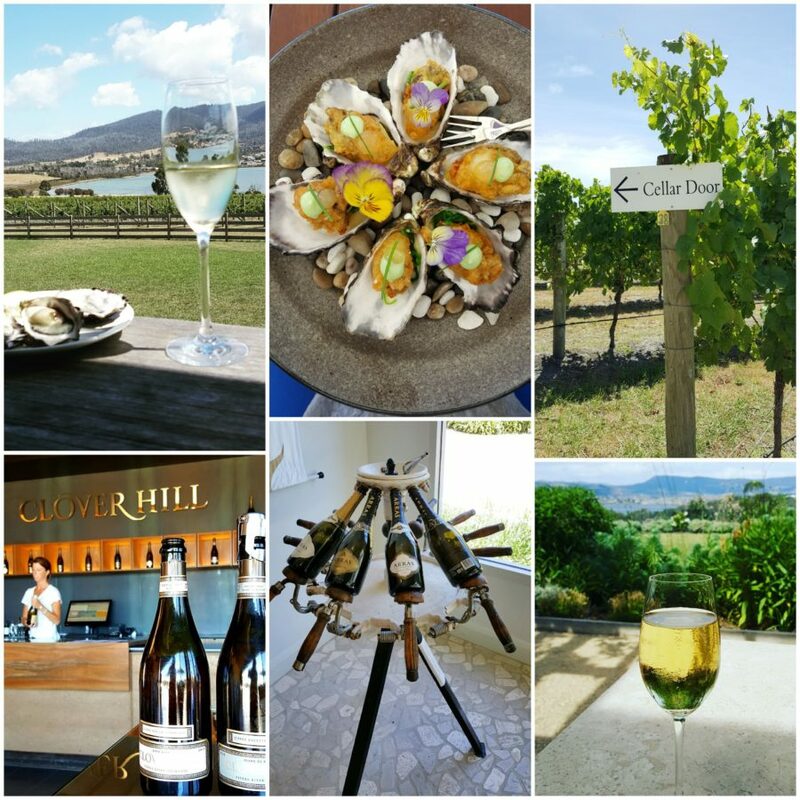 Clover Hill VINTAGE 2013 – 63% Chardonnay, 31% Pinot Noir, 6% Pinot Meunier blend. The palate is delicate and creamy, with fine bead and persistent mousse, light straw colour indicative of a chardonnay, has developed a golden hue during its three years on tirage. On the nose, it displays citrus and red berries, with a hint of toasted brioche. This is a delightful wine. Clover Hill Cuvée Exceptionnelle Blanc de Blancs, VINTAGE 2012 – 100% Chardonnay. The 2012 Blanc de Blancs is a pale straw colour with a fine, persistent bead and mousse. Aromas of fresh melon, underpinned by toasty notes and sweet cinnamon. The palate is bold and rich with flavours of fresh citris with a persistent soft minerality the lingers on the finish. Clover Hill Cuvée Exceptionnelle Vintage Rosé, VINTAGE 2013 – 100% Pinot Noir, limited release, is crafted via extended skin contact of Pinot Noir to create a soft, pink colour. Fine persistent bead and mouth filling mousse, rich flavours of strawberry and citrus with hints of brioche, with a fine crisp finish. Clover Hill Cuvée Prestige Brut. VINTAGE 2005 – 100% Chardonnay. This limited-release Late Disgorged Brut. A vibrant rich straw colour with a persistent fine bead are precursors to the refined and gentle foaming mousse. An assortment of fresh lemon curd and brioche, developed almond and toasty characters, it is the epitome of Clover Hill’s signature house style – a true combination of passion and patience. Cheese platters are available every day and share plates with seasonal local produce are available on weekends. The Clover Hill Elite VIP Experience , is a guided tasting experience and a great way to taste the range, which includes the limited release Exceptionelle and Prestige Blanc de Blancs, tasting plate and wine credit. It is $75pp and must be booked in advance. I mentioned earlier that we would learn more about Dr Andrew Pirie of the Pirie label whose name appears over and over in the history of sparkling wine in Tasmania. Aside from his continued research, published studies and consulting work, he has established the Apogee label. The goal to produce very high-quality wines from a small, hand tended area that is operated on a commercial and sustainable basis. The belief is that the combination of the highly researched site with the latest knowledge of terroir theory is leading to wines that are very expressive of the terroir. “A search for the ‘terroir’ of the famous French cool-climate areas of northern France in Australia led me to buy land in partnership with my brother David, in northern Tasmania in December 1973. This search study became part of my doctoral thesis on viticulture completed at the University of Sydney in 1977. The vineyard was named Pipers Brook Vineyard after the local brook and is now part of history. Pipers Brook’s second-label Ninth Island became the most widely distributed and recognised label from Tasmania. Pirie was the Pipers Brook sparkling wine label and was first made in 1995. It became the most awarded of all the wines I made and has been drunk by Her Majesty Queen Elizabeth II on at least two occasions. The vineyard name Apogee, means the highest point. 1. Use the latest climatology to locate a perfect ripening location for sparkling wine using the classic Champagne grapes Chardonnay, Pinot noir and Pinot Meunier with a small amount of Pinot Gris known as Fromenteau in Champagne. 2. Produce only Single Vineyard wines so that the output fully reflects the distinguished vineyard conditions and intensive vineyard manipulations. 3. Restrict the scale to 2 hectares, which is the average size of a holding in Champagne. This is deliberately chosen to test the theory that the ability to manage vineyards perfectly limits their scale. The Apogee project has had several objectives, the main being to produce traditional method sparkling that rivals Champagne. Others are to demonstrate how the latest knowledge of terroir can pin-point great sites and to show that single site sparklings can produce the best wine. 2014 Deluxe Vintage Brut. Light gold with fine mousse and a suitable foamy collar when poured. Aromas range from bready, yeasty overtones through to perfumed red fruits and lemon-rind with a faint salty oyster-shell character which is part of our terroir. Full palate with notes of toasty honey honey with a racy lemon finish towards the end. A vineyard blend of pinot noir, chardonnay and pinot meunier. Vintage Deluxe Rosé 2014. Light salmon pink (almost rose gold) with fine mousse. aromas of cherry, raspberry and musk are typical of this vineyard and are found in this wine. The palate shows strong midpalate richness, faint salty oyster shell with cherry and floral tones. A vineyard blend of 88% pinot noir and 12% chardonnay was hand-picked and whole bunch pressed, soaked on skins (saigné). Apogee is located very close to Clover Hill, and you could plan your itinerary to visit to the two of them. You may want to check in advance if Apogee will be open on the day of your visit, or take a chance and check to see if the signboard is out the front on the day. Founded in 1976, they have been producing sparkling since 1993. Geoff and Susan Bull cleared the site in 1978, planted the first vines in 1979 and established the first commercial winery on the East Coast. They were early pioneers in a new region which years later revealed exciting quality potential in wines. The region now boasts over a dozen different vineyards. The Freycinet Vineyard and Winery is family owned with daughter Lindy Bull and her partner Claudio Radenti taking over the family tradition of gently handcrafting the wines. I tasted the 2011 Radenti Sparkling which is 69/31 Chardonnay/Pinot Noir. It has spent 4 years on lees, I tasted green apple, citrus and some spicy notes that flow and merge with creamy, soft yeasty complexity and textures. The Radenti sparkling heritage has received multiple awards and the 2011 had just won gold at the Tasmanian wine show. Lovely deck overlooking the vineyard to enjoy a drink and the view. It is a great lunch stop, as there is food made from local produce at Tombolo Café, fresh seafood from The Fishers and you can relax on the deck with a glass of wine to match, overlooking magnificent views of the Hazards and ocean. There is also a fun lookout to climb. This was a very busy Cellar Door and definitely worth a stop for the view and something to eat. There is only one sparkling produced under this label, the Devil’s Corner, Sparkling Cuvée NV. Fresh crunchy apple, and a touch of citrus. It is lively and fresh in the mouth with a dry refreshing finish. 80% Chardonnay and 20% Pinot Noir. The second fermentation is done using the tank method, also known as the Charmat method, which produces bright, fresh fruit characters, in contrast the traditional method which produces a more complex flavour profile from aging on yeast in the bottle. Devil’s Corner, like the Pirie sparkling label, is also owned by Brown Brothers. Spring Vale Vineyard’s small and intimate Cellar Door is actually an old stable, which was built by convict labour in 1842 and is now heritage listed. The stable has been preserved (with minor restorations necessary) and is now a unique cellar door building with a very historic feel. The 2016 “Salute” Sparkling comprises 72% Pinot Noir, 23% Chardonnay and 5% Pinot Meunier. The aromas show fresh strawberry and lemon zest and a hint of vanilla. Fresh berry fruit give some sweetness to the palate which is nicely balanced with Granny Smith apple, leading to a dry, savoury finish. A classic aperitif sparkling, delicious with Tassie oysters. No café on site, but you can purchase a cheese box. There was a nice little picnic area set up with a tent for shade looking over the vineyard. With a focus on producing small quantities of handmade wine Milton are the winners of the 2017 Tasmanian Vineyard of the Year award. There are two sparklings produced, but unfortunately neither of them are available for tasting. They are available to purchase by the glass and take into the Sophie’s restaurant which shares the space. Located in a lovely weatherboard building with big verandahs with views out over the lake and vineyard. This limited release Vintage Sparkling is a medium bodied style with some yeasty complexity and creamy texture. Aging on lees for 5 years has contributed to a fine persistent bead. 2016 Sparkling Pinot Noir Laura. A lovely pale pink sparkling wine made predominately from Pinot Noir. Refreshingly dry, elegant and crisp with strawberry and cherry flavours and a long fine finish. I made this my lunch stop and paired it with a glass of 2016 Sparkling Pinot Noir Laura. The restaurant Sophie’s is the creation of chef Sophie Bermudes, who trained in Bordeaux and has spent the majority of her career working throughout the south-west of France. She has a French approach to Tasmanian produce. Guests can choose from a blackboard seasonal menu and take-away picnic options are also available. This is not a Cellar Door. It is an oyster farm gate shop … and yes, it is a shack (well caravan), located about 20 minutes off the Tasman Highway near Swansea at a place called Dolphin Sands. 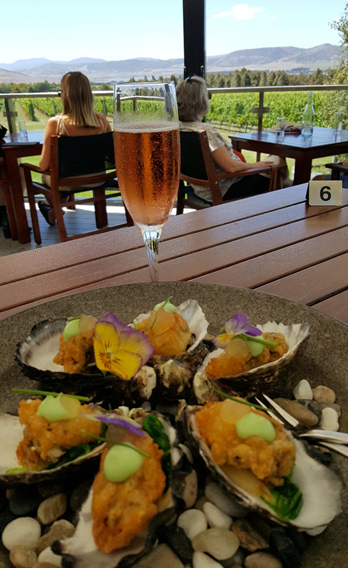 You could grab a bottle of chilled bubbly from one of your Cellar Door visits and include a stop here for freshly shucked oysters straight off the farm. Yum! A small family vineyard with four hectares of vines (Pinot Noir, Pinot Gris and Chardonnay), which are hand-tended. At a latitude of 42 degrees 53’ south, Bangor’s vineyard is one of the most southerly in Tasmania, and the world, making it a true cool climate site. There is a beautiful view over Dunalley and Blackman Bay which you can view from the verandah or from one of the picnic tables on the lawn. There is a cubby and sandpit for kids to play in. There is only one sparkling produced, but it was lovely, and matched with local oysters taking in the view it was a divine experience. Bangor’s 2012 vintage sparkling is a 60/40 blend of Pinot Noir and Chardonnay, made in the méthode traditionelle. A deliciously crisp sparkling displaying peach pear, white cherry and strawberry fruit flavours, balanced with creamy nougat and almond notes. 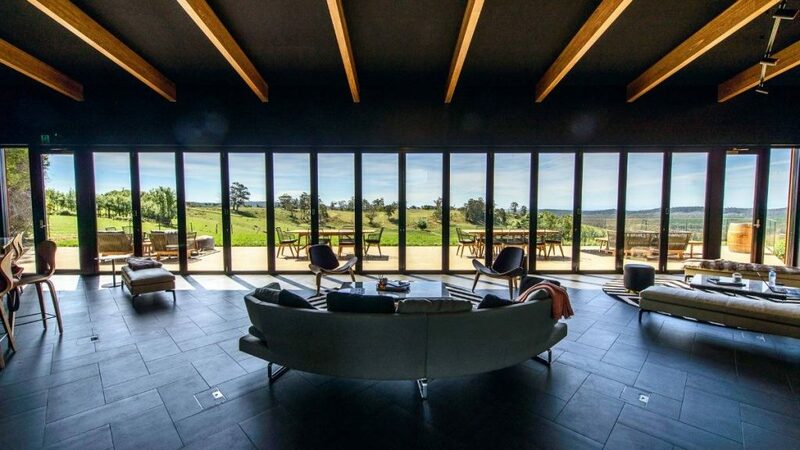 Located 20 minutes from Hobart in the Coal River Valley, the Frogmore Creek Cellar Door is housed in a rustic homestead that looks out over rolling hills and the vineyard. On the mezzanine floor you can take a walk around the display of art works depicting the history of winemaking in Tasmania. NV 42 degrees South Sparkling – 82% Chardonnay, 18% Pinot Noir. Aromas of toasty brioche and delicate citrus subtly emerge from the fine beads. Full and crisp flavours of apples with lengthy creamy structure. Fine and Subtle. NV 42 degrees South Sparkling Rose – 90% Pinot Noir, 7 % Pinot Meunier, 3% Chardonnay. This wine has a deep salmon colour with a nose of light strawberry flavours and fresh fruit. On the palate you should taste fresh red berry fruit with a creamy texture. 2016 Frogmore Creek Sparkling Cuvée – 64% Pinot Noir, 32% Chardonnay, 4% Pinot Meunier. Light beads, subtle, fresh and delicate. A beautiful wine. The Cellar Door includes a restaurant featuring seasonal local produce from sea, land and garden, with a deck with views out over the vineyard and a big lawn area with some lawn games and space for kids to roam. I dined here and had a beautiful food match of Tempura Oysters with the Sparkling Rose. You can now also visit the The Lounge by Frogmore Creek (Bar and Restaurant) located in the Macq01 building in Hobart, which is elevated over Kings Wharf. It is a lovely way to spend an afternoon enjoying views of the marina, whilst sipping a glass of their lovely bubbly. Stefano (Steve) Lubiana is a fifth generation wine maker who has carved out a niche in the Tasmanian wine industry. Steve identified the uniqueness that Tasmanian grape growing had to offer and tasted the potential for greatness. 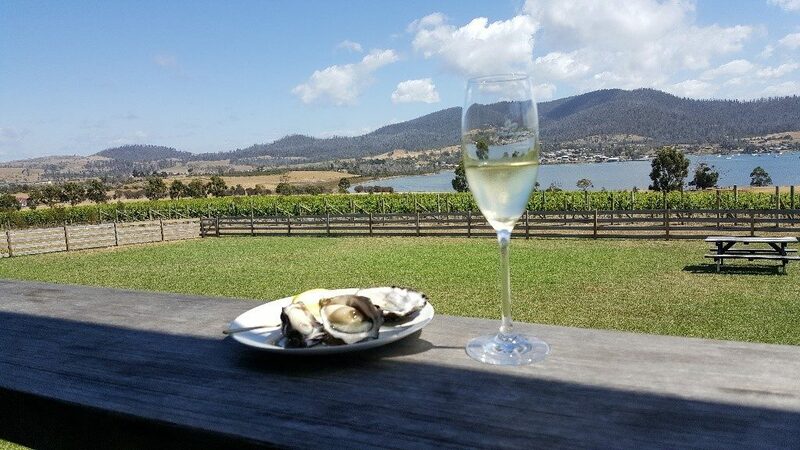 The family owned vineyard is around a 30 minute drive from Hobart and wraps itself around the picturesque foothills of the Derwent River estuary. Established in 1990 the majority of the estate is dedicated to biodynamically grown Pinot Noir and Chardonnay. I love Stefano Lubiana wines and order them whenever I see them on a menu. At the Cellar Door there is an Osteria, which can be described as a small ‘farmhouse’ style eatery in Italy. The menu here is fresh, seasonal and based around what comes out of their biodynamic vegetable garden. They harvest honey from their own bees and pickle and preserve their own produce. Free-range meats are sourced from local farmers and wild caught seafood from the pristine waters of Tasmania. Stefano Lubiana NV Brut Reserve – multi-vintage blend of Chardonnay and Pinot Noir that incorporates aged reserves of wine specially prepared for the production the house style of sparkling. The natural viticulture and low yields along with the reserve wine creates a sparkling wine that tastes so different – fruit-pure, intense, rich, creamy and complex. A Gold Winner at the Decanter International Awards. It is a great all-rounder sparkling wine. Stefano Lubiana Grande Vintage 2008 – A blend of Chardonnay (60%) and Pinot Noir (40%) with 7 years on lees before being disgorged in May 2016. A delightful classic ‘Tassie Sparkling’ with plenty of natural acidity. The winery was founded in 1962 and focuses on a small, very high-quality output. From estate-grown fruit, the ultra-premium wines are made using small-batch winemaking techniques in a gravity-assisted winery. They do make some lovely sparklings. 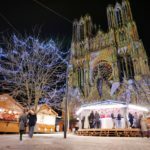 You could easily spend a half or even full day taking in all there is to see and experience, and they also offer amazing accommodation so you could stay overnight. From Hobart, you can take the Mona ferry, which is around 25 minutes, or around 20 minutes by car. A big thank you to Clover Hill, Jansz and Bay of Fires who provided giveaways for our subscribers as part of our feature on Tassie Sparkling Wine. 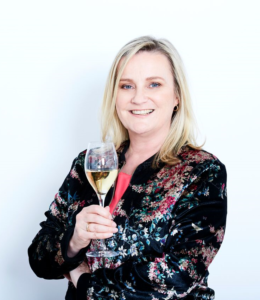 Natalie Pickett is the Founder of The Bubbles Review which is for people who like champagne and other bubbles, written by people who have a love of all things sparkling! 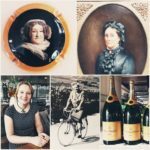 At The Bubbles Review, we like to debunk some myths, make the art of drinking champagne accessible, explore bubbly regions and champagne bars, and provide events for you to join us and indulge. Like to keep following us? Sign up to The Bubbles Review list and you will be included in our Subscriber prize draws. The monthly giveaway is usually a chance to win a lovely champagne or sparkling gift. Join our list! Here’s cheers to the fabulous women of Champagne!